I recently spoke to James Lawrence, The Iron Cowboy on my podcast. He completed 50 Ironmans, in 50 days, in 50 states. .0007% of the world’s population complete an ironman every year. Walking down the street in the United States and you’ll meet 1 Ironman in every 1000 people. Guess it depends on your circle, because I’ll see four or five of them during every road workout. The entire race took longer than it was for us to drive from the Eastern Shore back to Indianapolis. Here’s the 5 Epic Mental Toughness Lessons I Learned from the Ironman. If not now, when? If not you, then who? I couldn’t answer those questions! I once wrote down one hundred things that I wanted to do before I died. A full Ironman was on there. But, that was not a deep enough present day why. My major “why” had to do with others. My family, Josh Fugate, Izzy, and Tyler Trent. A friend from church, Todd Dolbeer passed away from pancreatic cancer days before the race and I thought about him as well. Your why has to make you cry, if it doesn’t it’s not your why. There simply will never be a perfect time for anything challenging and epic in our lives. We are all too busy! So, quit getting ready to get ready and just do it. I started training on July 1st. I had 90 days to prepare for the race… My biggest fear was the bike. Not only did I have to borrow a bike again, but I needed to get serious training and miles! So, I joined a Cycling team/group. The first group ride I joined was with about 12 other cyclists who all had the same jersey on and seemingly top of the line bikes. It was like try-outs for a team of one. It was the first day of summer camp when you knew no one, except everyone knew each other. I had no jersey and didn’t know how to ride in groups. But, I faced the fear and did it anyway. I was an athlete, so it all came back to me. But, this cycle repeated itself several times with different cycling groups. I got a little better during every ride and closer to my goal and just like summer camp or a new team, eventually made friends. Face the fear and do it anyways! It wasn’t all sunshine and rainbows. I was taught some mental toughness lessons along the way. I got dropped from a ride twice and had a bad crash during one of my 100 mile rides, but always kept the goal in mind of the Ironman. By the time of the Ironman race, I had logged over 1400 miles. Check out the article by NYC Running Mama about lessons learned from her ironman Journey(i.e., there is no need to fear the unknown). Everyday was a training day and I took the attitude that there was NO tomorrow. So, my goal was not only the miles and the workout and the challenge, but it was also a mental toughness lesson about focus. I made it a point in training to focus on the moment and to focus only on this workout. This was my strategy to enjoy the journey. I got to ride all over Indiana and run crazy miles on the trail and see different places that I wouldn’t have without this race. More importantly, I got to meet and train with different people and became friends with these individuals! They helped so much with various parts of preparation. People and relationships are all part of the journey and has nothing at all to do with the destination. This skill of focusing on the moment translated directly into the Ironman race itself! I could only focus on just this mile! I didn’t become all-consumed with trying to finish. I was just focused on making it to the next aid station. We live in an overly-sensitive, easily-offended, anonymous hating, and self-congratulating, world. We can also live in a world where we are trying to create a better us and a better you! It depends upon on attitude, outlook, and actions, which reality we create. 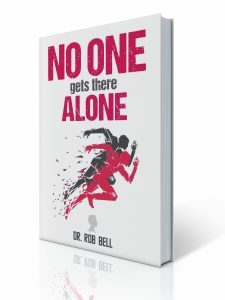 I wrote the book NO ONE Gets There ALONE because a stranger stopped his own race during a 1/2 Ironman to help me, an idiot! And that Hinge moment made all of the difference in my life. I went into this ironman race with a lesson already qued up. It was “who are you going to help?” I had no idea who is was going to be of course, but it presented itself during the bike when a guy had a flat tire and I didn’t hesitate for a second. I also was able to pray with a guy before the race even began while we were waiting to go to the swim corral. He had some serious anxiety and was a believer, so I shared with him my only go to! Pray and if that doesn’t work, pray again! During the Ironman, the race really starts when it comes to the run. My first several miles were actually okay. But, like in life, things go bad and I started to have stomach cramps around mile 10. By mile 13, I wasn’t feeling good at all and started to get the chills and feel cold. I saw this movie before at my previous races. So, when I threw up on the course at mile 16, it was actually a relief. I felt better and was able to get moving. Except, I hadn’t eaten in a few hours and I didn’t want to eat, thus I had little energy. Our second wind in life is always right around the next corner! I got my second wind at mile 21-22. I was able to get a steady clip going and ran with another mate, named Greg Sinche, who suffered from a stroke at age 4. We ran the last few miles together and I finished the race like I was running a 5k. I believe when we are at our best and others are doing the same, then it’s the easiest time to love on each other more. Even after all the vomiting, I was able to get sub 14 hours, which was one of my goals.